“Roots and Wings” is an on-going project close to my heart. I made the original work in the style, “Uprooted”, during a camping trip over a Memorial Day weekend following my first winter of ever experiencing the effects of SAD (Seasonal Affective Disorder). So happy to be out in the woods and sunshine after a particularly rainy, gray winter, I ran around gathering branches, root balls, and bark remnants around our camp ground and arranging them to build a tree. Gradually the idea formulated, and by the end of the weekend, I had created quite the project for myself. I photographed what I had laid out with the materials, then packed them all up to bring to the studio and begin to clean, coat, and assemble the tree, then surround it with a black and white, silver gelatin print collage of a forest. “Roots and Wings” is the second project I created in this style as a commission for a local Portland company. The title comes from a conversation with my mother-in-law telling me how she raised all 4 of her sons with roots and wings, a grounding sense of home and values and understanding of who you are, with the confidence to go out in the world and make your own fate. I felt that this spirit really embodies how I feel about the works. This is an on-going project. It is my attempt to personify the concept of Mother Nature, along with Walt Whitman’s beliefs he presented in “Leaves of Grass”. They are a variety of double exposures combined with collage techniques. The largest, and most difficult, piece in this project is 72 *54 inches. 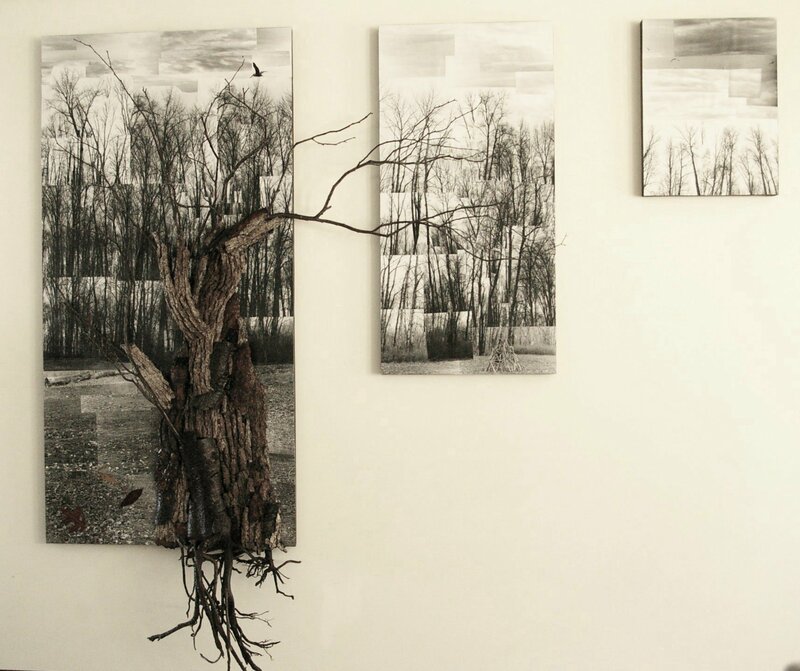 It is comprised of countless parts of trees assembled together to form one tree, with one figure representing Gaia imbedded into the parts to form the image. I built the image of the tree piece by piece, bark by bark, while simultaneously building the figure piece by piece, double exposed into each individual section of bark, having to match up scale and contrast with every exposure. It took months. So many times I have found myself out in nature and overwhelmed by the sense of something far greater than me managing and moving through this world. I don’t try to understand it, just accept it, and find great comfort in that belief. These works are a homage to that. “In Their Element” is a continuation of the themes I visited while making “In Context”. 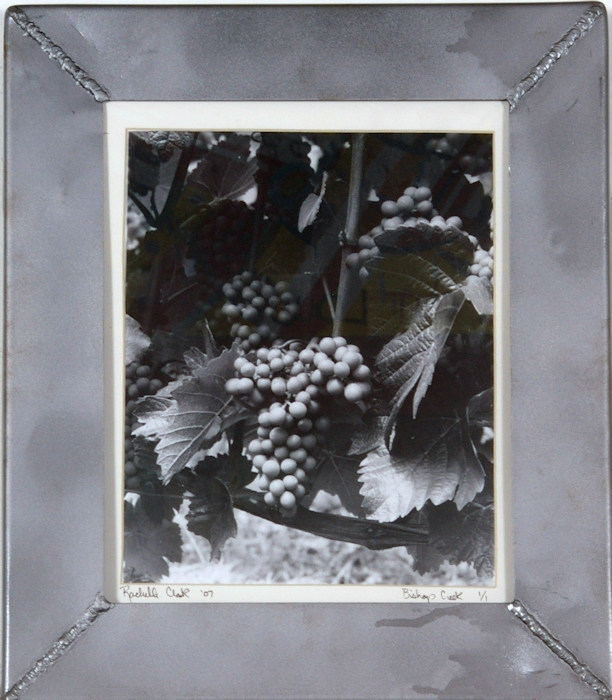 I am fascinated by the juxtaposition of a photograph framed, or somehow paired, with elements contained in the image. It is almost making it come to life! In this project I have images from the Oregon Coast mounted on a sheet of wood and framed with pieces of driftwood, placing these shots in their own setting. 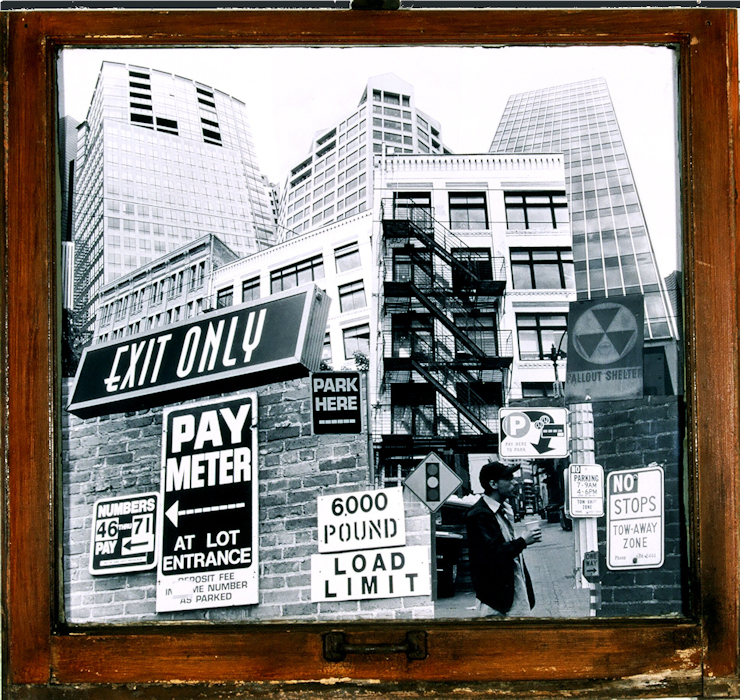 Rachelle’s show, “Dense-City”, is a series of black and white photographic collages emulating the overwhelming visual intake that derives from urban living. Layers of images compile to demonstrate the contradictions we live with but fail to notice, like the cracks in the sidewalks where the dandelions push through. Some pieces are as large as 4 ft. by 7 ft., all are framed in antique windows. One reoccurring theme for me has become surrounding a photo in elements of its subject matter. 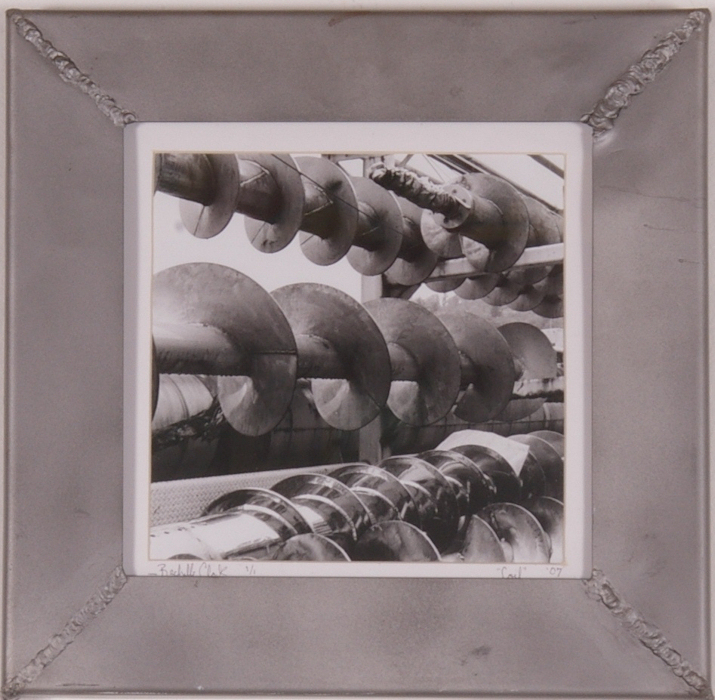 This is a continuation of that theme — homemade welded steel frames around industrial images, the intent being to put the subject in its environment. Steel maintains a major role in our Industrial Revolution. It is that role I am attempting to capture with this exhibit, and pay homage to. Hover over the image or click on the gallery below for details on size and availability. 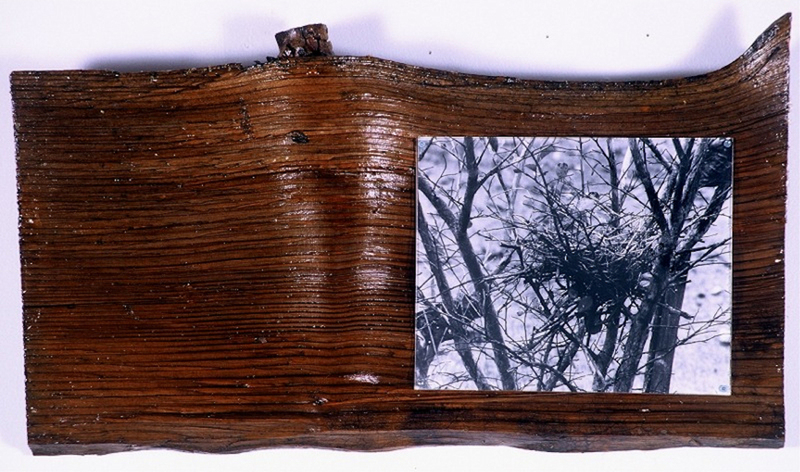 by Rachelle Clark In Context is a series of images whose subjects are connected to the pieces of wood they are mounted on, be next found in a tree or a fence line disappearing at a vanishing point. The concept being to place a stolen moment of time in context with a tangible element. The wood was varnished to seal it. The images are covered with plexiglass to protect them.